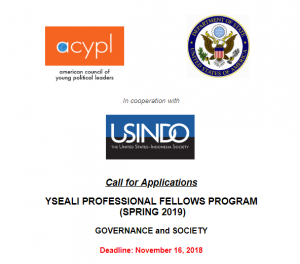 The American Council of Young Political Leaders (ACYPL) and the U.S. Department of State, in cooperation with The United States – Indonesia Society (USINDO) are pleased to announce the application process and deadlines for the Spring 2018 Young Southeast Asian Leaders Initiative (YSEALI) Professional Fellows Program. The YSEALI is the U.S. government’s signature program to strengthen leadership development as well as networking in Southeast Asia, particularly between young leaders from United States and Southeast Asia. The YSEALI PFP Spring 2019 will be held from April 20 – May 31, 2019. This year will focus on the theme of Legislative Governance and Society. It is open to young political and policy leaders from Brunei, Cambodia, Indonesia, Laos, Malaysia, Myanmar, the Philippines, Singapore, Thailand, Timor-Leste, and Vietnam. The YSEALI PFP includes a week of political and policy discussions in Washington, DC; a month-long individual fellowship in an American office; and participation in a three-day global Professional Fellows Congress in Washington, DC. This exchange of ideas and knowledge will serve as a foundation on which to establish sustainable two-way partnerships between the young political and policy professionals from these Southeast Asian countries and their American counterparts, with the goal of strengthening good governance, enhancing economic empowerment, and increasing civic engagement. With the invaluable experience gained from this fellowship, the young leaders from Southeast Asia may identify their generation’s greatest challenges in the region and develop ideas in tackling them. Cannot hold a dual-US citizenship or have traveled on a J-1 VISA for a Department of State sponsored program in the past two years. The international fellows from each country will travel to Washington, DC for a 5-day program orientation and federal government overview as well as cultural outings. Each fellow will participate in a 4-week intensive fellowship in a separate political, policy, or civil society office with day-to-day mentoring and guidance from a single point of contact, their fellowship host. The fellows will meet their American hosts, an ACYPL alumni, to attend meetings pertaining to current events in the area, and together will develop action plans for a series of follow-on activities to be conducted in the fellows’ home country. At the conclusion of the program, all international fellows will return to Washington, DC for a 3-day Professional Fellows Congress where they will interact and share their experiences with other international fellows from different programs. Upon returning to their home countries, select international fellows will work with their American hosts to create an 8-14 day program in which the American hosts will visit each of fellows’ places of employment to learn more about what they do, assist in the continuing implementation of their project, meet with local leaders, as well as enjoy cultural outings. The application is accessible through here or if you would like to see the program at-a-glance you can access this link first. Kindly note, we do not accept direct or hard copy submission. Eligible candidates are required to submit the complete application form byNovember 16, 2018 the latest. An incomplete or late submission will not be considered. If you were recommended or learned about this program from USINDO (ACYPL’s in-country program partner), please indicate it in the application form. Only shortlisted candidates will be interviewed by the panel consisting of representatives from ACYPL, U.S. Embassy, and USINDO. Should you have any further inquiries and questions, please contact Mr. Elliot Bell-Krasnerat at Ebkrasner@acypl.org or Ms. Kaylee Boalt at kboalt@acypl.org or by phone at +(1) 202-857-0999.